Current theoretical frameworks, engineering approaches and technologies in ICT are not sufficiently capable of efficiently and effectively sustaining the authenticity, understandability and usability of digitally encoded information over time. From its origin in cultural heritage and eScience, digital preservation (DP) has emerged as a key challenge for information systems (IS). Yet, there is a profound lack of theoretically sound and verifiable frameworks to address digital longevity. Currently, numerous strands of applied DP research are hitting a glass ceiling. In the object and content dimension, there is a profound lack of objective, standardised and comparable metrics and benchmark collections for experimentation. While fields such as Information Retrieval have for decades been able to rely on benchmark collections annotated with ground truth to enable systematic improvement of algorithms and systems along objective metrics, DP is yet unable to provide the necessary ground truth for such benchmarks. These objective indicators, however, are the key enabler for quantitative experimentation and innovation. 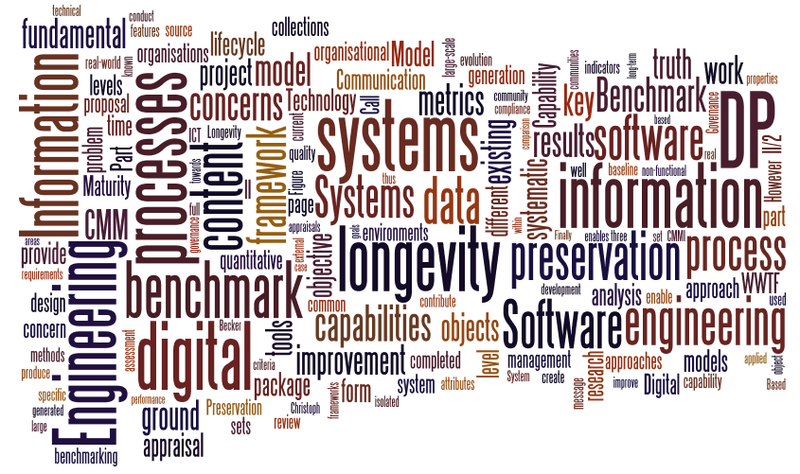 In the dimension of systems, process and organisations, existing models are not sufficiently taking into account the concerns of digital longevity and information preservation over time. On the other hand, valuable domain knowledge in the area of DP is insufficiently anchored in systematic architecture and design principles. As a consequence, systematic comparison and improvement of processes, systems, and organisational capabilities is not possible. Finally, in the engineering dimension, there is an increasing move towards the ex-post preservation of complex systems and processes rather than solely information. However, up to now, digital longevity is not acknowledged as a fundamental design concern in the IS lifecycle. For content, we will create a model-driven benchmark generation framework that provides realistic approximations of real-world digital information collections with fully known ground truth that enables systematic quantitative experimentation and measurement. For systems and processes, we will create and evaluate a Capability Maturity Model for DP that enables systematic process improvement and governance of ICT systems with respect to longevity over time. Finally, we will lay the groundwork for pushing longevity upstream and address it as a fundamental design concern in the IS lifecycle. By providing the first systematic, quantified approach to measuring, controlling and improving DP processes and organisational capabilities, Benchmark DP will enhance the ability of organisations to control and improve processes for information management and IS design to achieve desired levels of longevity.